Nature. Chemistry. Medicine. 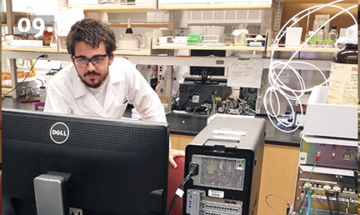 Developing a new drug is a long and challenging process. As a citizen scientist, it all starts with you and a scoop of dirt. 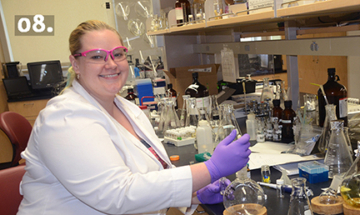 The Natural Products Discovery Group at the University of Oklahoma is composed of a team of scientists including principal investigator, Dr. Robert Cichewicz, research scientists, post-doctoral fellows, students, and staff. 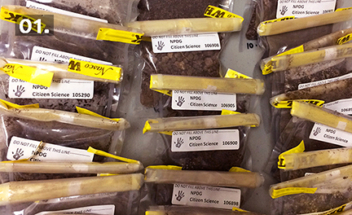 When your soil sample arrives, it is brought to our interactive laboratory called the Chemical Zoo for processing. 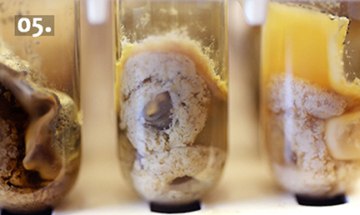 The fungi are cultured and prepared for extracting their natural products. The natural products are tested against a range of disease targets including different types of cancers, infectious bacteria, and parasites. To explore this process further, please hover your cursor over the images for more details. 01: It all starts with you! When your soil sample is received, it is taken to the laboratory for processing. 02: A small sample of the soil is applied to a Petri plate and the fungi are grown for up to a month. Photos of the fungi from your sample are taken and posted to ShareOK for you to see. 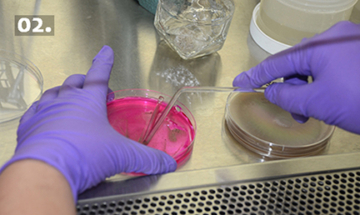 03: A representative of each fungal strain is selected and cultured individually on a petri plate. Samples of the fungi are cryogenically stored at -80º C (-112º F) for long term preservation. 04: DNA samples are taken from each isolate that was selected for cryogenic storage. 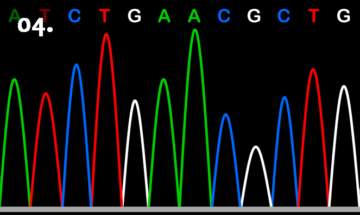 Portions of the fungal DNA are amplified using a process known as PCR. The DNA samples are sequenced and the information is used to help identify the fungi. 05: A small-scale culture is prepared by growing the fungi on Cheerios. Fungi grow very well on this breakfast cereal and produce many natural products. 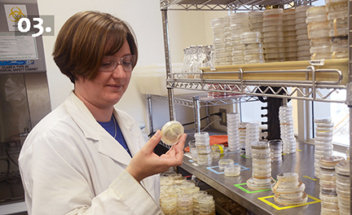 The fungi are processed to extract the natural products they have produced and the sample is added to the lab’s extract library for testing. 06: Extracts of natural products are tested for biological activity (tests include a range of disease targets including cancer, infectious diseases, neurological disorders, parasites, and others). Preliminary chemical analyses are conducted on the natural product mixtures. 07: Dereplication is carried out to eliminate known compounds and determine if scale-up studies are warranted. Fungi that show promising disease-fighting activites and produce new natural products are selected for further in-depth studies. 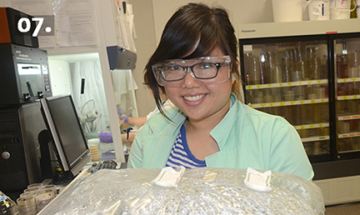 Large-scale cultures of the most promising fungi are grown on Cheerios in large “spawn” bags. 08: Biologically active natural products are purified using a variety of chromatographic methods (such as high performance liquid chromatography) in a process known as bioassay-guided fractionation. The chemical structures of the purified natural products are determined using several techniques including NMR and X-ray spectroscopy, as well as mass spectrometry. Biological tests are conducted on the new natural products to determine each compound’s potency and selectivity. 09: Data are analyzed and reports are prepared for publication describing the results of the biological and chemical investigations. Further tests are conducts as warranted. 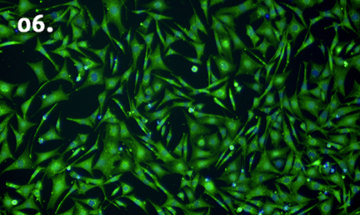 The lab consults with colleagues in the biotechnology sector and medical sciences to explore potential therapeutic applications of the new compounds.